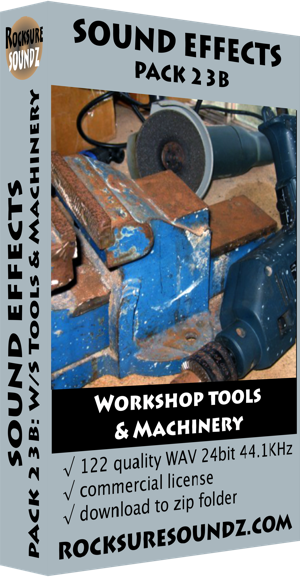 Sound Effect, Pack 23B Workshop Tools and Machinery. This pack contains a wide range of workshop sounds. It includes nuts and bolts, hammering sounds, arc welders, small hand tools and electric tools right through to larger machine tools. A natural companion with the other packs in the "23" series. All sfx were recorded with high quality microphones and analog recording equipment, and are presented here as a zip of 24 bit/44.1kHz wav files.